AP - Advantage Play - Advantage play is an advanced technique in matched betting where we don't actually lay our bets but still have good value in the long run. In the case of casino offers, it's when we only get a bonus if we lose money. This can be used for particular sports offers, accumulator refund offers, virtual sports offers and also casino offers. ARB - Arbitrage bet - When the back odds are higher than the lay odds. These bets make a profit even without a free bet being involved. You should be aware that you risk your account being restricted and/or banned from promotions should you frequently place arbitrage bets, so we advise you to avoid these bets where possible. You can see more about arb betting on the forum here. Boom - A boom is a celebratory response used on the forum to describe anything positive. A nice win can be described as a "boom". "Bot Topping Up" - Someone may say this when there doesn't appear to be enough liquidity at the exchange to lay your bet, but a bot is continuously topping up the liquidity as lay bets are placed. Chelts - Cheltenham Festival - A horse racing festival taking place in March. A matched bettors favourite due to the great offers. EV - Expected Value or Estimated Value - The long term value of a casino offer. You can read more about this in the Casino Guide. FS - Free spins - Used on casino slots. KYC - Know Your Customer - Checks by bookmakers to verify your account such as asking for ID. This is completely standard and you can expect to do this occasionally. LC - Live Chat - A bookmaker's service to contact them. Mug Bet - To place a bet when no promotion or bonus is involved. You can see more about mug betting here. Palp - Palpable Error - If a bookie displays odds that are obviously incorrect, they can claim it is a palpable error and void any bets placed at that price. (E.G, they offer odds of 10 for England to win when every other bookie is offering odds of 1.5. It's clearly a mistake). Price Boost - Price boosts occur when bookmakers knowingly boost a market in an event for a short period of time. We can make money here by backing at the boosted higher odds and laying at lower lay odds for an instant profit using the calculator tool in "normal" mode. You can see more about price boosts here. QB - Qualifying bet - Your initial bet to qualify for an offer. QL - Qualifying loss - The loss you make from placing your qualifying bet. OP - Opening Post - The first post of a forum thread. RTP - Return To Player - Every casino game will have an RTP (Return to Player) which is displayed as a percentage. It is the theoretical percentage of wagered money that will be paid back out to the player over time. For example, we have a slot with an RTP of 95%. This means that in the long run, for every £100 that you play through the game, you will receive £95 back (95% of £100 is £95). You can read more about RTP in the Casino Guide. Sharb (Sharbing) - The same as Arbitrage, but the back bet is placed using in a betting shop rather than online. SNR - Stake Not Returned - This usually applies to free bets. It means the free bet stake is not included with the winnings. We use this setting in the calculator for any free bets that are SnR. It can also be used to lock-in a profit on bets where you only get a refund if your bet loses. SR - Stake Restricted - When the amount you're allowed to bet with a bookmaker has been reduced. SR - Stake Returned - This applies to normal bets, or certain bonus types. It means your initial stake is returned along with your bet winnings. Variance/Volatility - For slots and casino games, it's a word used to describe how much the payout from each spin can vary. Low variance = When a game gives you small wins frequently. High variance = When a game gives you large wins but relatively infrequently. You can read more about variance in the Casino Guide. WR - Wagering Requirement - Some bonuses have wagering requirements attached. For example, a £10 casino bonus might have a 5x wagering requirement. This would mean you need to play through a total of £50 worth of bets before the bonus itself can be withdrawn. Note, this does not necessarily mean you need to deposit or risk £50 to do this, as you would use any winnings to continue the wagering. You can read more about wagering in the Casino Guide. 2UP - A promotion ran by Bet365 and Paddy Power where you get paid out as a winner if your team goes 2 goals ahead in a match. 2UP will be commonly used to refer to any early payout style offer. You can see more about these types of offers here. 4MM - Four Means More - An old promotion from William Hill. ACCA - An accumulator bet (a bet of more than one selection in the same bet). More information on accumulators and how to lay them can be found here. AGS - Anytime Goalscorer - A bet on a player to score at any time during a match. BTTS - Both teams to score - A betting market that involves betting on whether or not both teams will score a goal during any set match. For example, in the match Arsenal v Man City, if you bet on "Both Teams To Score - Yes", both teams would be required to score a goal at any point during the match in order for the bet to win. Alternatively, if you bet on "Both Teams To Score - No", you would require neither team or just one team to score a goal during the match in order for the bet to win. CS - Correct score - A bet on the correct score of a match. Eg. 2-1 to Chelsea. DD/HH - Double Delight/Hatrick Heaven - An offer ran by Betfred. You can find more about it here. FGS - First Goalscorer - A bet on a player to score first. HT/FT - Half Time/Full Time - A betting market that involves betting on the result of each half of a football match. For example, in the match Arsenal vs Man City, you might bet on Arsenal / Arsenal, which would mean a bet that Arsenal would win the first half, and the full match. Or, you could bet on Man City / Draw, which would be a bet for Man City to win the first half, but for the game to end in a draw. LGS - Last Goalscorer - A bet on a player to score the last goal of a match. Over / Under - A betting market that involves betting on the number of goals in a football match. For example, you might bet on "Over 2.5 goals", which would be betting that there would be 3 or more goals. 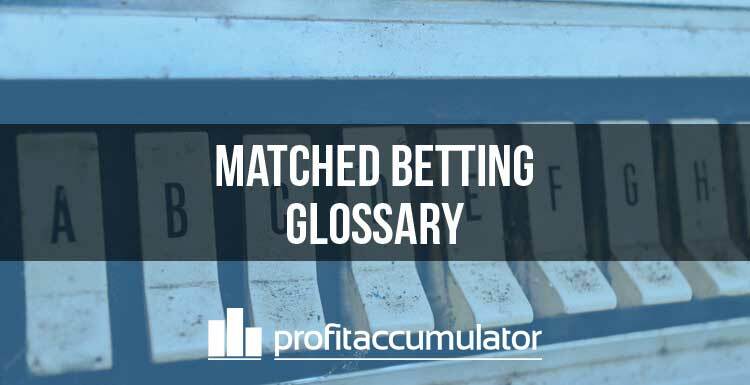 Be careful not to get mixed up between Over and Under when placing your lay, and also avoid getting mixed up between "Over 2.0" and "Over 2.5", as they are different bets. PYP - Pick Your Punt - A special market from Betfred. You can find more about these types of markets here. RAB - Request-A-Bet - A special market from Sky Bet. You can find more about these types of markets here. WOP - What Odds Paddy - A special market from Paddy Power. You can find more about these types of markets here. WWGI - Win, win, get in - An old promotion from Coral. Matched Betting Related and General Horse Information: You can find the Horse Refunds and Extra Place threads for the day here. 2C - 2 Clear - A promotion with William Hill. H5 - A promotion with William Hill. AP - Ante-Post - This is a horse racing market that appears long before a race is due to start. Antepost markets usually disappear 1-2 days before the race. You should avoid betting on these markets, as if your horse is withdrawn before the race, your bet will be settled as a loss. AW - All Weather - Ground surface. BBH - Beaten by a head - When your horse is beaten by a distance of a head. BBL - Beaten by a length - When your horse is beaten by a distance of a length. BBN - Beaten by a neck - When your horse is beaten by a distance of a neck. BOG - Best Odds Guaranteed - A promotion that is offered by various bookmakers, usually on Horse Racing and Greyhound Racing. If the odds that you place your bet at are lower then the SP (Starting Price), then your bet will be settled at the SP odds. You can see more about BOG and which bookmakers offer it here. EW - Each Way - A bet that is offered by bookmakers consisting of two separate bets: a win bet and a place bet. For the win part of the bet to give a return, the selection must win, or finish first, in the event. For the place part of the bet to give a return, the selection must either win or finish in one of the predetermined places for the event, such as first place or second place. You can find more information on each way bets here. Extra Place - Bookmakers will sometimes pay out for more places in a horse race than the exchange. These additional places being offered are known as extra places. You can read more about them here. LTO - Last Time Out - Refers to the horse's last race. LTO - Lengthen the Odds - Betting on a horse to win by a certain distance, and you get a larger price for your bet. NR - Non-Runner - When a horse has been withdrawn from a race. NRNB - Non-Runner No Bet - Bookmakers sometimes offer NRNB on ante-post markets. Ordinarily you would lose your bet if your horse didn't race, however with NRNB your bet will be void in this scenario instead. Rule 4 - This occurs when another horse is withdrawn from a race. The odds of your bet may be lowered to reflect the reduced competition. Your back bet odds may be reduced, and your lay liability will also be reduced in proportion. This won't usually leave you in a losing position, as typically the lay liability is reduced more than the back odds. You can find out more about Rule 4 here. SP - Starting Price - The odds that a horse actually starts the race at rather than the price you bet at.